OK so thanks to Carla... I have come across an article about a film being scheduled for this summer in the Scottish Highlands. Apparently, everyone up there thinks it's a remake of Highlander... and they think Kevin McKidd is starring in it. ....that doesn't sound quite right to me. Here's what we know: Ann Peacock - writer of the Kit Kittredge screenplay and the original Chronicles of Narnia screenplay - is writing the screenplay for Outlander. We knew this wayyyyyy back in early October when Diana "Herself" Gabaldon confirmed it at ComicCon in NYC. Here's what else we know: Melissa Rosenberg - writer of the Twilight series screenplays - has agreed - or is still in negotiations - to write the screenplay for a Highlander remake (I know, Christopher, I know... THERE CAN BE ONLY ONE!!! Shhhh... there now...poor dear) and it's rumored that Kevin McKidd will star. What I find interesting about all of this is that I searched all over IMDB and am not finding much about a Highlander remake... but that's neither here nor there. What IS here AND there is that there is possibly a finished OUTLANDER screenplay... and only a planned HIGHLANDER screenplay. But you do the math. So that's where Tracey and I are this afternoon. In speculation heaven. I hope it's what we all think it is..Outlander!!!! Verrrrry interesting, if it's true! Who knows, maybe you're right? You realize, of course, that you ARE being a rumor-monger. :-) But we don't mind. 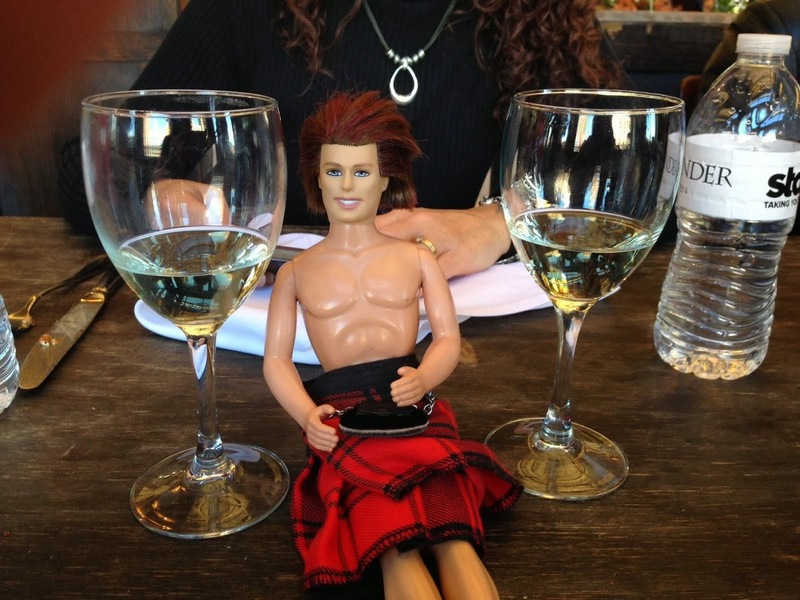 How else would the OUTLANDER grapevine hear about things like this? We positively thrive on speculation, and this is yet another thing to speculate endlessly about. :-) Even if it turns out not to be about the OUTLANDER movie after all. FWIW, I think Kevin McKidd is an excellent actor. Yay, a movie set in the highlands! Whatever film it is, it will involve kilts and that's a win for all of us. But Rosenburg? If she has a highlander telling someone to, "Hold on tight, spidermonkey" she gets a root to her ladystones. VERRA true about a Highlands movie. I'll be there, no matter WHAT it is...right?? Sit me down - give me some popcorn - and let me drink it in! I almost wouldn't mind the muppets being in it if the backdrop is a Scottish loch or mountain. I have to give some info I heard first hand from Catherine Hardwicke at Twilight convention I went to (oooh did I admit that out loud?) I don't believe "Hold on tight, Spider Monkey" was written in the script. She said they didn't like what the script did say... so she gave them like 10 different lines to choose from... and that's what RPattz chose because he was the most comfortable saying that. (snicker) It is the only time KStew laughs throughout the entire film... so that's something... but no... I dinna want to hear a hot Highlander uttering those words. I 1000% agree, lass. Omigod, rumor-mong away! I love all the speculation. And I love the rumorrrs! Of course I'll watch anything set in the Highlands - sigh - and I feel like Kevin McKidd will almost obligatorily be in Outlander in some capacity or another (unless contractually precluded from doing so, hmmmm). Sorry to burst anyone's bubble here but Kevin McKidd is due to be in a film called "Brave" which is set in Scotland. The release date is 2012 so I guess that they must be filming this summer if there are any outside shots. No worries, Mrs. Cookie... that Brave film is a Disney Pixar animation. It's just his voice. McKidd is too old to be Jamie in Outlander & I'd swear I'd read as much in DGs comments on her blog once upon a time. But the rest...INTERESTING! i have to say that i would not be a fan of Kevin McKidd as Jamie, he is way to old, and no where near my personal mental image of Jamie. It would be verra disappointing. But i agree that he should have a place in the series somewhere i do like him as an actor. WOW! This is all exciting! First Carol, who cares if you are spreading rumours as long as they are GOOD ones! I agree with pretty much all of what the rest are saying and would watch a film based in Scotland anyday. Add some kilts and I'm a droolin. That whole spidermonkey line should have definitely been edited, WHAT> spidermonkey> seriously RPattz? I would just like to give a vote in for Kevin McKidd, I like him (and I'm not THAT old), I think he would be great as the older Jamie, you know for the future films, hahaha. Where you planning on going to see Diana while she is in NYC in June & July to promote the 20th Anniversary Outlander Edition? I am in CT and am thinking of taking the train down to meet her and get a copy autographed. often I'm left feeling that same old feeling...THE BOOK was so much better!